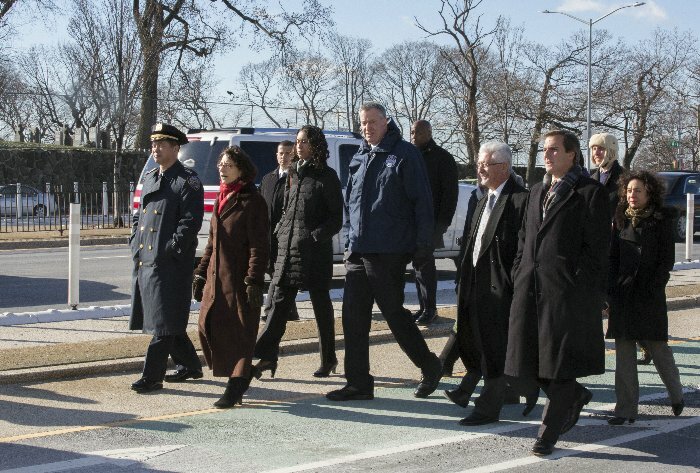 NEW YORK—Mayor Bill de Blasio, Department of Transportation Commissioner Polly Trottenberg and NYPD Transportation Chief Thomas Chan today announced that under the city’s Vision Zero program, 2015 was officially the safest year on New York City streets since record-keeping began in 1910. 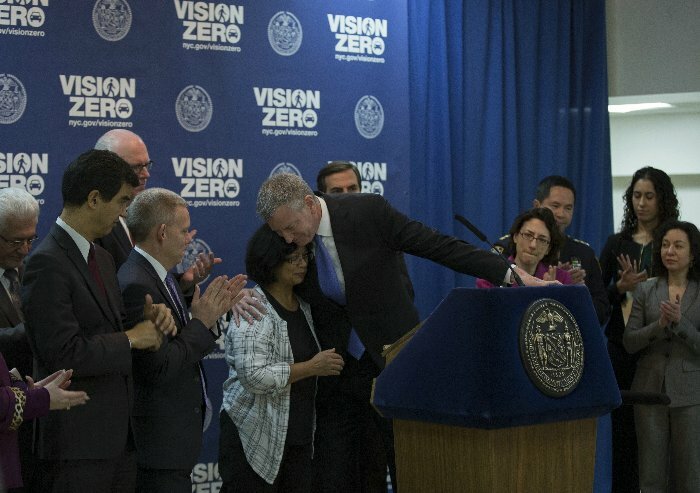 The Mayor pledged to take Vision Zero further in 2016 by unveiling $115 million in new capital investment for plans to calm traffic, as well as expanded efforts to crack down on dangerous driving, make hazardous left-turns safer and expand enforcement. “We are serious about saving lives. Vision Zero is working. Today there are children and grandparents who we might have lost, but who are instead coming home, safe and sound, because of these efforts. This progress is just the beginning, and Vision Zero is going to move ahead with even more intensity in the coming year,” said Mayor de Blasio. The 231 traffic fatalities in 2015 are 66 lower than the 297 fatalities that occurred in 2013, the year before Vision Zero began. Pedestrian deaths — a historic low of 134 in 2015— fell 27% during that period. The previous lows were 2011 with 249 traffic fatalities and 2014 with 139 pedestrian fatalities. Comparatively, based on National Highway Traffic Safety Administration (NHTSA) data, U.S. pedestrian fatalities increased three percent in 2014 and are estimated to have increased again in 2015. The City also released the Vision Zero Year-Two Report (available here: http://www.nyc.gov/html/visionzero/assets/vz-year-end-report.pdf) detailing the progress made in the last year. Today’s announcement was made along Queens Boulevard, where significant redesign and safety improvements have been nationally recognized. “We at DOT are extremely proud that 2015 was the safest year on record for pedestrians on New York City’s streets. However, we recognize that any fatalities mean we have more work to do. Thanks to Mayor de Blasio’s leadership and vision, we will remain dedicated to making our streets safer for all,” said Department of Transportation Commissioner Polly Trottenberg. More Safety Redesigns: The DOT has already begun planning and reaching out to communities in efforts to redesign more of the city’s crash-prone corridors and intersections, including extending the Queens Boulevard safety project further east, significant traffic calming and pedestrian improvements on Lower Grand Concourse, intersection improvements at Bay Street and Victory Boulevard in St. George, safety improvements along Astoria Boulevard and traffic calming on Brooklyn’s Meeker Avenue. 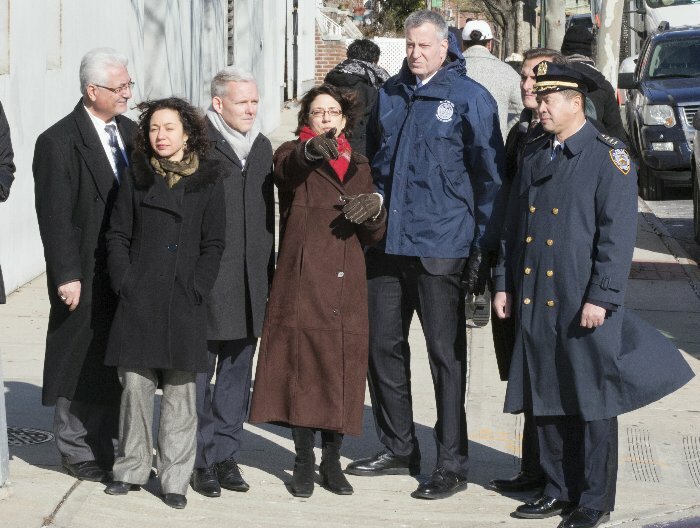 The $115 million in new capital investment includes nearly $59.4 million for Safe Routes to Schools at 37 schools around the City; $29.6 million for area-wide improvements in Long Island City; $4.1 million in additional funds for the Brooklyn Waterfront Greenway project; and $22 million for projects on Tillary Street in Downtown Brooklyn, 25th Street Plaza in Manhattan, Allen and Pike Street Pedestrian Malls in Manhattan, Mott Avenue in Far Rockaway and North Flatbush Avenue in Brooklyn. Safer Left Turns: Left turns account for nearly 30% of fatal and serious injury pedestrian crashes. The City is undertaking a 100-intersection pilot initiative to test safer left turn designs. These treatments will be evaluated to determine if they increase motorists yielding to pedestrians, slow vehicle turns and improve safety. If successful, they will be expanded to additional sites across the City. Safer Bicycle Routes: Building on the record 12 miles of physically-protected bike lanes created in 2015, the most in a single year, and the success of those designs reducing crashes for both cyclists and pedestrians, DOT is planning to install protected lanes along Amsterdam Avenue, 1st Avenue, 2nd Avenue and 6th Avenue in Manhattan, as well as a two-way protected bike lane on 20th Avenue as part of upgrades to the Queens Waterfront Greenway. Targeted NYPD Enforcement to Protect Seniors: Seniors comprise 13% of the city’s population but accounted for 38% of the city’s pedestrian fatalities in 2015. The NYPD is undertaking aggressive enforcement against dangerous driving near the city’s 250 senior centers, as well as locations where many seniors live and walk. From January 25 to January 31, the NYPD will be conducting its first senior-focused enforcement initiative of 2016, with every precinct focused on traffic enforcement in areas of our city where seniors walk. Increased Use of Speed Enforcement Cameras: Speed cameras work. Violations for excessive speeding in a school zones typically declined by half at locations after speed cameras were installed. But under state law, cameras’ hours of operation are restricted to school hours, on days when school is in session and they are only deployable on streets abutting a school building. DOT analysis shows that 85% of injuries and fatalities occur on streets and during times when speed cameras are not authorized to issue violations. The City will work to pass legislation in Albany to expand the hours and streets to target the times and locations where crashes most often occur. Earlier Education: The Department of Education and the DOT will work together to incorporate a Vision Zero curriculum designed for 4th to 6th graders starting in the 2016-2017 school year and disseminate vital information to parents and caregivers to curb dangerous driving behavior, especially near schools. “As a member of the City Council, my top priority is keeping New Yorkers safe. I was proud to work with the Mayor to help develop Vision Zero and pass key pieces of its legislation, and I am even prouder of the results we have seen all across the City. The bottom line is that thanks to Vision Zero we are saving lives,” said Council Member David Greenfield. 80 Vision Zero safety improvement projects—60 of which were created at priority locations identified in the Vision Zero Borough Plans, including a protected bike lane and traffic calming on Queens Boulevard. A record 12.4 miles of new protected bike lanes, making NYC’s bike network over 1,000 miles long. The NYPD issued nearly 40,000 Failure to Yield violations, nearly triple what had been issued annually between 2011 and 2013, prior to Vision Zero. The NYPD issued over 134,000 Speeding violations, a 75% increase compared to the average between 2011 and 2013. Installation of 140 speed cameras in authorized zones, with close to 1.5 million violations issued since the program began in 2014. On average, speeding declined by 50% at fixed camera locations. Since the Your Choices Matter campaign began, 86 percent of surveyed motorists report that they will drive more carefully and yield to pedestrians when turning and approaching crosswalks, with 87 percent reporting that they will avoid using their phone when driving. Street Teams reached over 500,000 people, with education followed by targeted enforcement, resulting in over 17,000 moving violations, 24,000 parking violations and 128 traffic-related arrests. TLC released Drive Like Your Family Lives Here, an educational video required for cab drivers and other City drivers. DCAS is also working with other City agencies to install devices on City vehicles to monitor and report whether vehicles are speeding, making hard stops or are otherwise driven in an aggressive manner. The devices have so far been installed in 20,000 vehicles. Source: CityHall, Mayor De Blasio’s Office.